Ever wondered how much your favorite seiyuu get paid? 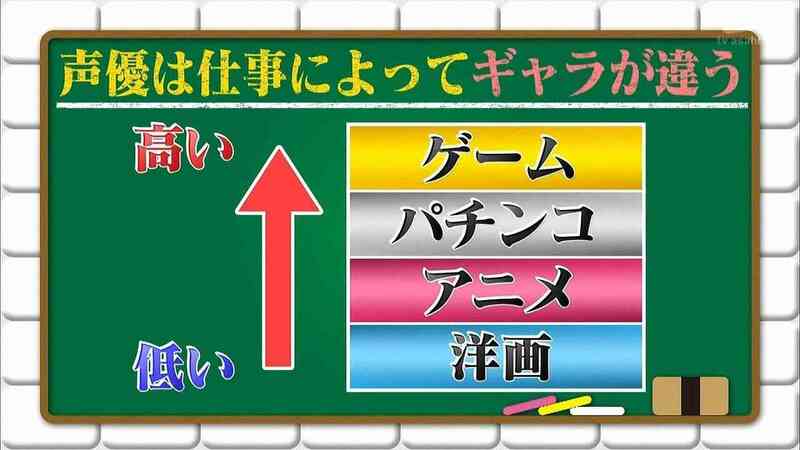 In Japan, there is a ranking system for seiyuu. The ranks are from “A” to “F”, with “A” being the highest. Each rank has its own set pay. For example, “A” rank seiyuu are paid 45,000 yen (about $443) for one 30-minute anime episode. 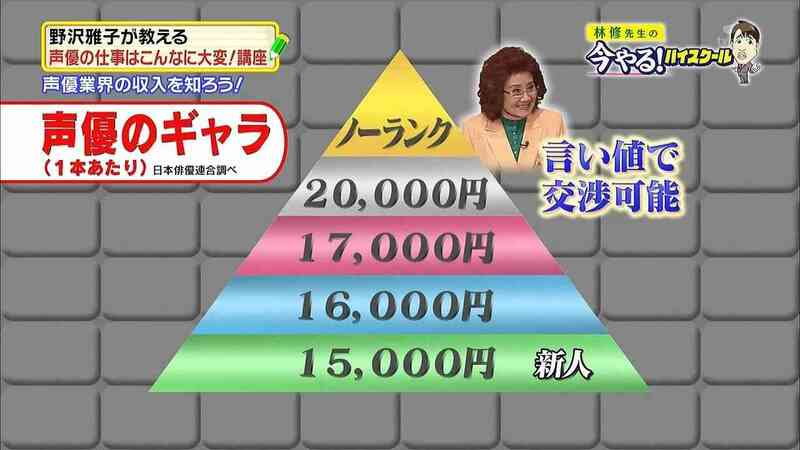 Above “A” Rank are “No Rank” seiyuu who can set their own price. For example, voice actress Kaneda Tomoko revealed that she gets paid approximately 30,000 yen (about $295) for one anime episode. You would think that Kaneda would at least be “A” Rank because she has been in the seiyuu business for 14 years, but she isn’t. The seiyuu business isn’t easy. Seiyuu don’t even get paid that much right off the bat. New seiyuu start off in the “Junior Rank” and are stuck with this title for three years. For one 30-minute anime they are paid 15,000 yen (about $147). After three years as Junior Rank they will join the “A to F” ranking system. Rising in rank depends on experience and popularity. Do seiyuu get paid more for voicing main characters? No. Their pay is solely dependent on their rank. Rank is essentially synonymous with pay grade. Do seiyuu get paid differently for media other than anime? Yes. You might think that voicing a character for an anime would pay more than other media, but it actually doesn’t. Anime pays less than video games or pachinko. Unlike for anime, voicing video game characters takes a lot more time because the actors must read each line one by one. For example, on an episode of BluRaji, a radio show for the popular 2D fighting game BlazBlue, seiyuu Ueda Kana said that it was very stressful and took forever to complete the lines for the tutorial in BlazBlue Continuum Shift. Seiyuu make guest appearances on variety shows and release CDs to earn extra money. Pay grades for characters by media type, from highest to lowest: Video games, pachinko, anime, Western film dubbing. What do you guys think about this ranking system? Would you join the seiyuu business or not? What rank do you think your favorite seiyuu is at? I think it’s fair enough. You get paid by your skill, pretty much same like some online game that I’ve played before, the higher your rank, the higher your rewards to get. I’m guessing someone like Sawashiro Miyuki, Hanazawa Kana, Kamiya Hiroshi, Ono Daisuke and Takahiro Sakurai must be at least A above because their popularity. It’s said that this industry is one of the hardest to break into in Japan. Only the lucky ones actually get to live off of their earnings as seiyuu.